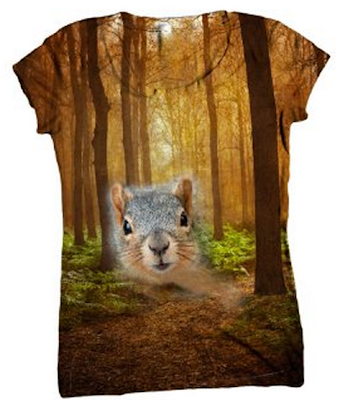 All-Over Print Forest Squirrel T-Shirt for Men, Women & Kids from AnimalShirtsUSA. You can buy this shirt from Yizzam as long sleeve, tanks, tees, chiffon, and even as leggings, often in sizes from XS to 4X. Yizzam's AnimalShirtsUSA offers a great line of all-over print shirts. This "spirit of the forest" squirrel is no exception. Eerie, creepy, wacky and wonderful, this shirt gets bonus points for a great color palette, an engaging scene, and a funny squirrel image. This squirrel embodies the meaning of "animal spirits." These shirts are printed on an individual basis using special printing technique that can leave some small white areas in wrinkles. This means that every shirt is unique. Some people, though, want a flawless uniform print. Check out the links above to learn more; AnimalShirtsUSA shows more images of the squirrel shirt, including various outcomes of their printing process.